Christmas is over and it's the start of a brand new year - hoorah! Your grass is starting to feel the cold, crisp change in the weather. Although it's not quite spring yet, it is important to ensure your garden and artificial grass stays in good condition through the cold, wet weather, ready for the warmer months ahead. Throughout the winter, your garden can really take a hit; after spending the entire summer caring for it, the winter then seems to destroy all your hard work. With an artificial lawn, there's no need to worry because they are robust and can stand all types of weather. However, they still need a little TLC. Although there's no need to mow or water the grass there's still a need to make sure that your lawn looks beautiful. 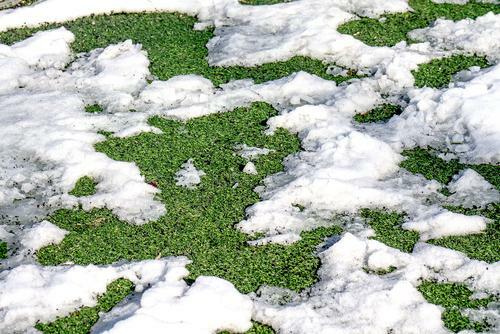 We've got some top lawn care tips to see you through the rest of winter, so please read on! The fibres in artificial grass stiffen in the ice and frost and become slippery, so be careful when waking over the lawn. Leave any snow or ice to melt naturally, but if the snow does build up you can remove it by hand so that you don't damage any of the fibres. You can use shovels to remove snow but use plastic rather than metal as it's less likely to damage the fibres of your grass. If you do feel the need to speed the de-icing process along you can use salt but do so sparingly and do not use any chemicals. During downpours make sure to check the drainage system to ensure that everything is working as it should be. If there is a lot of rain, your system could become waterlogged or damaged leading to turf deformity and it could result in your lawn becoming unstable. Real lawns can really take a lot of damage in a downpour, but synthetic grass can stand up to this and stay looking as good as new when cared for properly. If you're expecting the winter to be particularly cruel, you can prepare and protect your lawn by using a tarpaulin sheet as a cover. This doubles the layers of protection to your artificial grass. You would still be able to walk across the grass underneath, but it would protect the fibres from possible damage during the winter from snow, ice and rain. In the cold weather, it's natural not to want to venture outside unless necessary but don't forget about your grass. Although there isn't a lot of care needed in the winter you still need to check up on it occasionally. There's a grass for every garden and Artificial Lawn Company ensure that you have the right fit for you. You will be proud to look out the window at your lawn all year round. For more information on looking after your artificial grass please call our team today on 01474 364320.